Was POG at WBC 2001 a "POGfest" or a "POGmare"? That depends on who you talk to. The biggest difference this year was three rounds of full campaign game qualifying play, followed by three semi-final elimination rounds. For the brave, determined, POG finalists, David Dockter and Tom Drueding, that meant SIX eight-hour campaign games. GM Jim Falling yields his baton to the tournament winner, David Dockter. David intends to seed pairings next year using previous tournament/AREA results and perhaps use a shorter scenario for qualifying rounds. Contrary to the accepted theory, the CP won most of the 39 games with 51.3% CP victories, 41% Al victories, and 7.7% draw results. Twenty-six of the total games opened with the Guns of August event card play. Of these, 46% were CP victories. Of the six games that reported not using a GOA opening, half were CP victories. (Seven games did not report). This does not support the camp of players who believe that non-GOA is the only way to play the CP side. About half of each side's victories ended prior to turn 10, showing that quick victories are possible. Only eight games were resolved after turn 15. 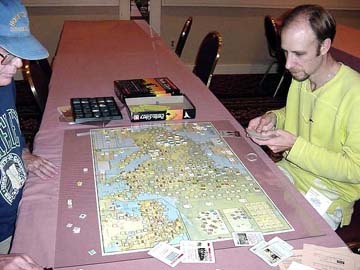 Game designer, Ted Raicer, was successfully able to play the Treaty of Brest Litovsk and knock Russia out of the war, a very rare event in this tournament. armies. David was able to stabilize the west with big replacement card plays and then moved to the East. Since Sinai and Allenby were somewhat delayed, David took Egypt with the TU YLD army and German support. He was also able to cause the Fall of the Tsar, although just missing the extra points due to a neutral entry by Romania. Peter conceded on Turn 18, realizing it would be difficult to regain the five VP lost in the Near East. Russians and force the Tsar's Fall. Tom conceded on T15.